There are constant examples of the struggle between safety and economics all the time. In some cases, the expense of this struggle is human lives. Vehicles that should have been recalled and then fixed for a pretty affordable price can remain on the road until a person dies because of the defect. Unfortunately, the injuries and fatalities that often occur could have been prevented for a small amount of money that would not have impacted the large companies involved at all in many cases. Another area where economics and safety are a serious conflict is in the trucking industry. 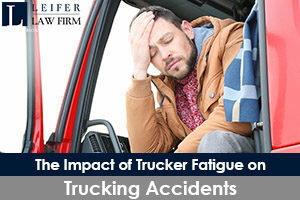 According to information from the U.S. Department of Transportation, as well as the Federal Motor Safety Administration, driver fatigue is considered the top cause of the more than 4,000 deaths that occur due to accidents that involve large trucks every year. Due to the staggering statistics mentioned above, the FMCAS created and issued a new rule in 2011 that put a limit on the “hours of service” that truck drivers could operate throughout the country and in the state of Florida. Under these new and revised rules, truck drivers are required – by law – to take a 30-minute break within eight hours of the beginning of their shift. Also, the prior 34-hour rest period, which was referred to as the restart, was amended to let a driver only restart one time during a period of seven days and to take at least two rest periods between the hours of 1 AM and 5 AM during the restart shift. These new rules and requirements are proposed for safety purposes, but they have also impacted the economics of the trucking industry. These new rules are restricting the average number of hours that a driver can be on the road each week from 82 to 70 hours. This has related in fewer hours and reduced income for all drivers, which also means that trucking companies have employed more drivers to meet their stringent deadlines. There are some members of congress that are still fighting this restart provision. Unfortunately, even though the number of hours a driver is allowed to be on the road has been reduced, trucking accidents are still prevalent. And, with more drivers being hired, the possibility of these accidents has increased in the past few years. If you or someone that you love is involved in a trucking accident, it is a good idea to hire a personal injury attorney. They can review the facts of the case to determine who is at fault and if you are entitled to compensation. If you need help with your trucking accident case, contact our team of attorneys at the Leifer Law Firm by calling 561-660-9421.